Wyckes Furniture Outlet Warehouse store Irvine, Santa Ana, Huntington Beach, Costa Mesa, Newport Beach, Westminster, Stanton, Anaheim, Tustin, Garden Grove and Buena Park. Our Cerritos store is conveniently located off the 91 and 605 for easy access to all of Los Angeles. We are surrounded by Long Beach, Carson, La Mirada, Whittier, Lakewood, Bellflower, Paramount, Norwalk, La Mirada, Cypress, Anaheim, Torrance and Downey. Located on Gridley Rd. 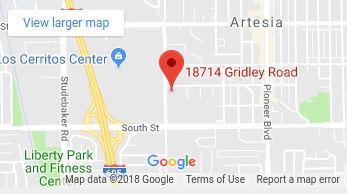 between South St. and 183rd St. at 18714 Gridley Rd, Cerritos CA 90703. We are conveniently located off the 605 and 91. If you are heading North on the 605, Exit South St. at the signal off ramp make a right onto South St, the next signal is Gridley Rd. make a left on Gridley Rd. we are 1/8 mile down on the right hand side. If heading south on the 605 Exit South St. at the signal off ramp make a left onto South St, the next signal is Gridley Rd. make a left on Gridley Rd. we are 1/8 mile down on the right hand side. Our Cerritos store is directly across the street from the Cerritos Mall and Macy's. Our Cerritos location is our warehouse and distrubition center for Los Angeles and Orange County offering easy freeway access and a centeral location.